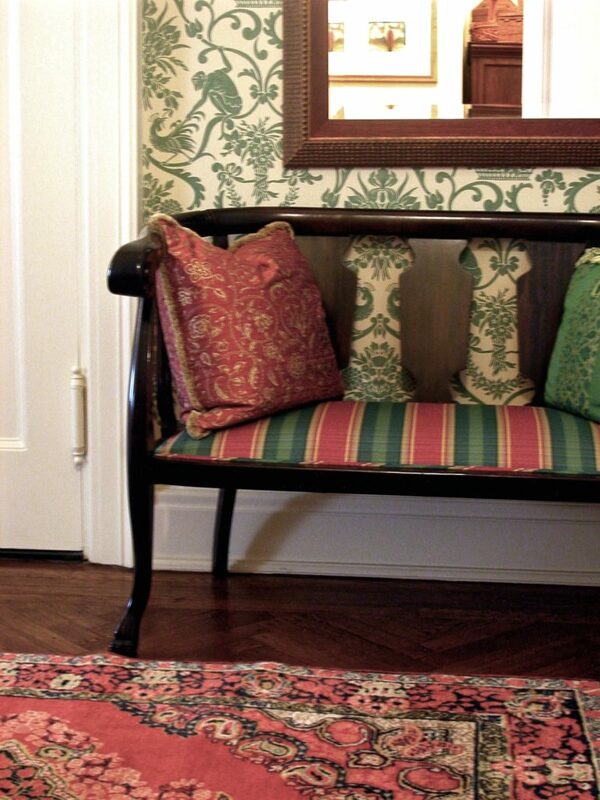 The front areas in this circa 1906 apartment had been gutted in the 1970’s and all of the original moulding and room configurations were removed. The rear areas were left as a warren of small rooms and narrow hallways. In order to restore the original elegance in the front and create a more functional space for modern living in the rear a complete renovation was required. 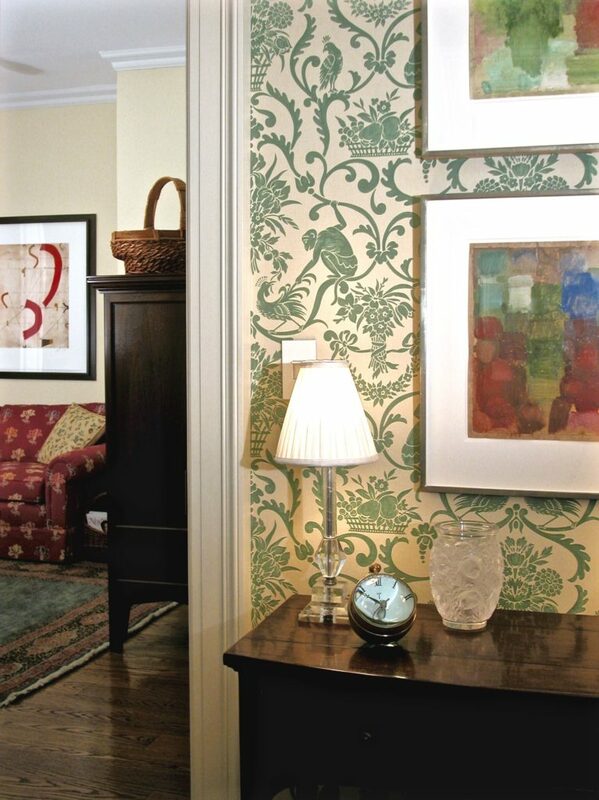 Traditional patterns in wallpapers and fabrics layer pattern upon pattern. Contemporary art work blends while adding a modern note. 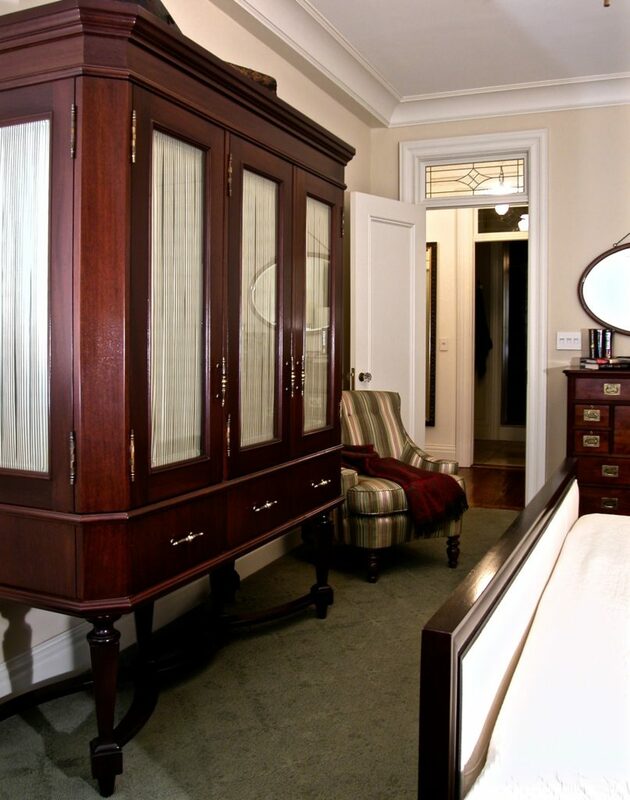 Lots of architectural detailing including deep crown moulding, base, wainscote and custom casings were all designed to recreate a turn of the century feeling. 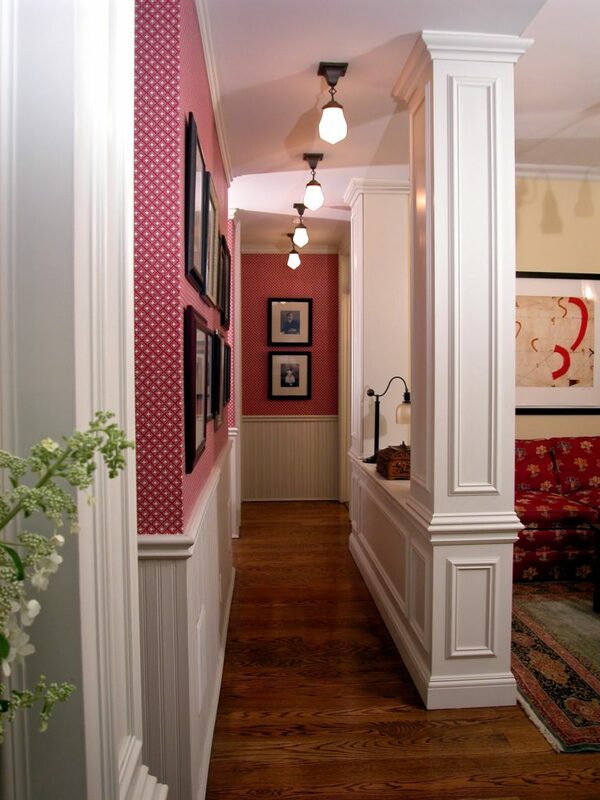 Antique center room light fixtures were mixed with contemporary reproductions to recreate the elegance of the period. An antique inlaid box sits on the classic coffee table. 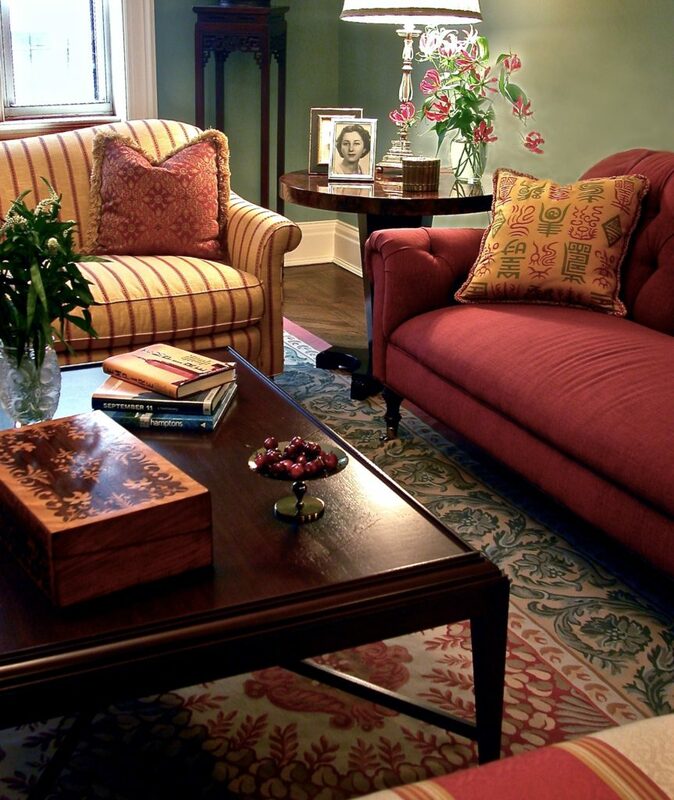 Aubusson carpets in the Living Room and Dining Room continue the lively play of patterns in upholstery fabrics, brightly colored sofas and pillows while a brightly patterned wallpaper in the Dining Room adds to the layers of pattern upon pattern. 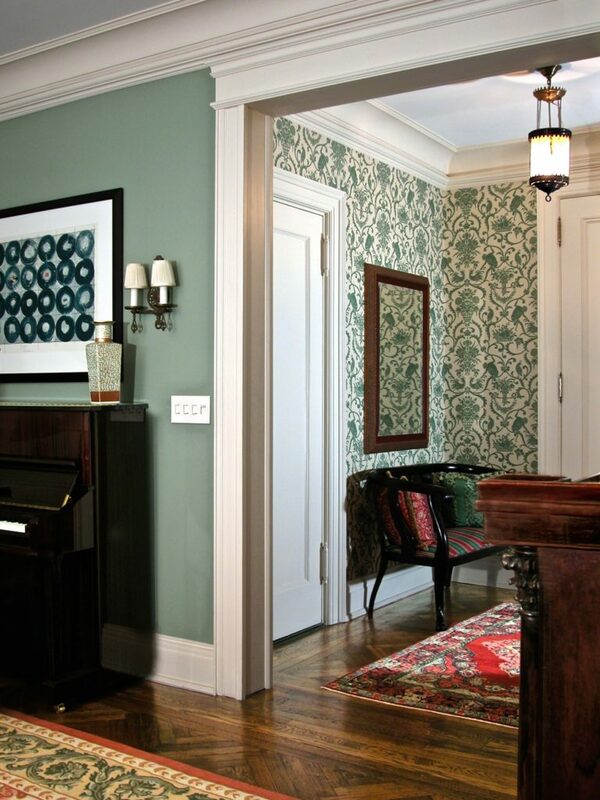 Separate rooms were recreated in the front area but large openings maintain a spacious feeling. 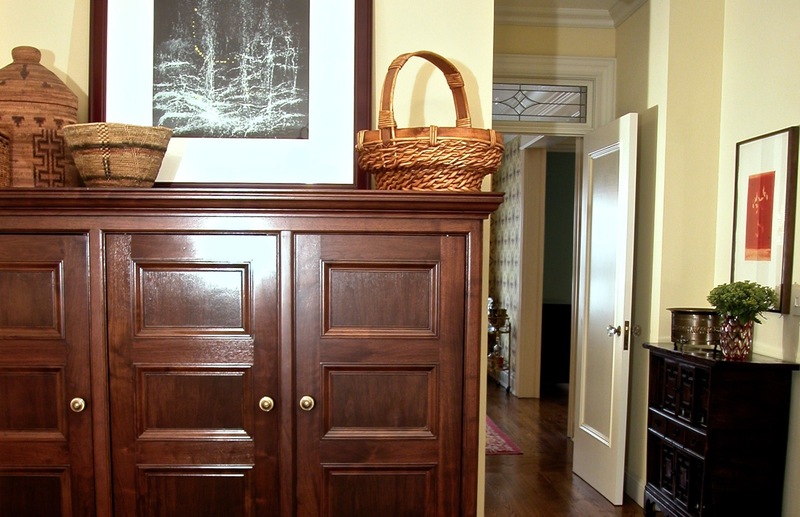 Custom built in cabinets in the Dining Room provide both architectural interest and functional storage. 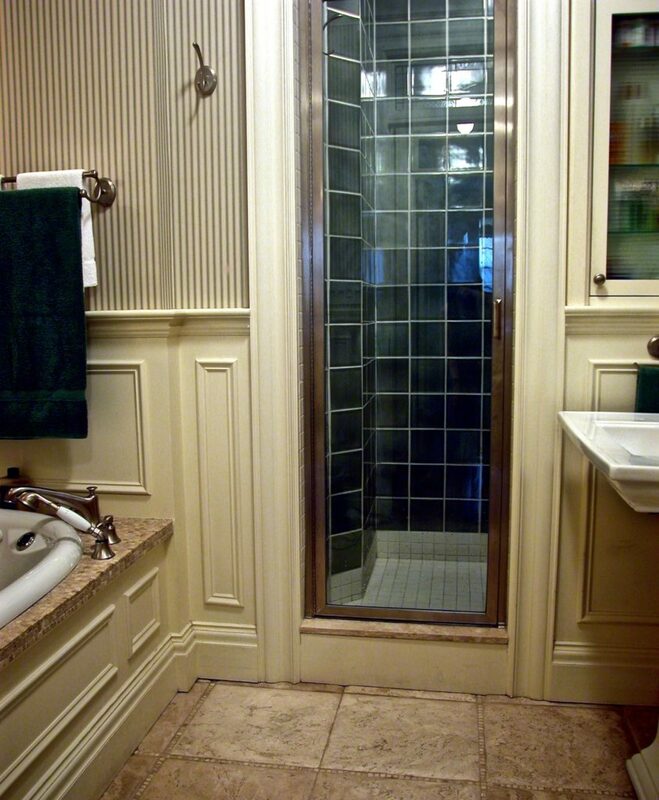 Doors were installed with custom designed leaded glass transoms above to maintain the opening height restoring the grandeur of the original architecture. 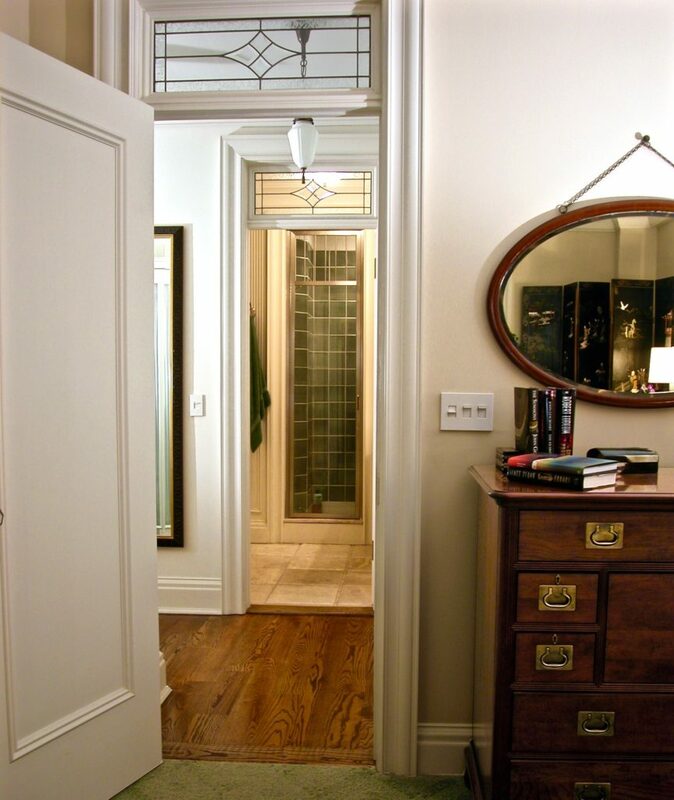 A dressing room was created in the hallway to the Master Bedroom and Bath by housing clothing storage behind pivoting glass paneled doors with shirred curtain panels on both sides of the entrance. 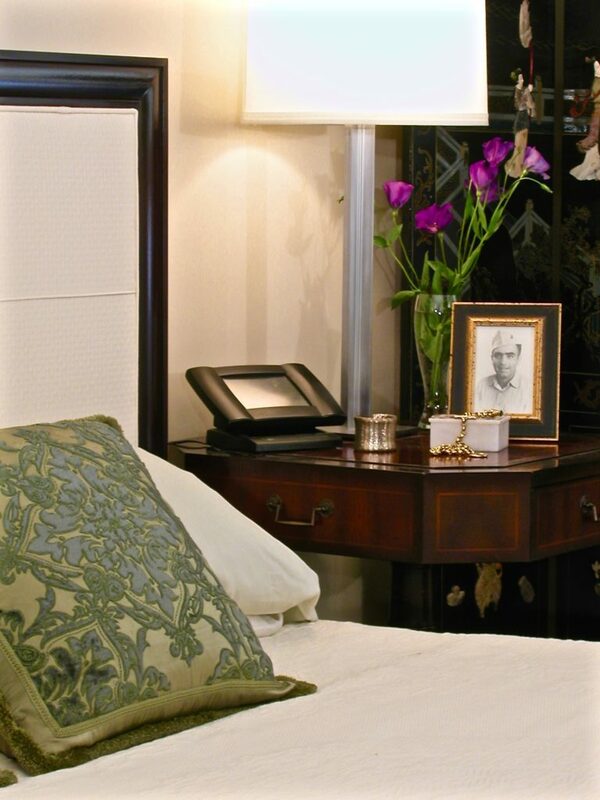 A Chinese screen in the corner of the Master Bedroom adds elegance and contrast. A contemporary steel lamp was added to the vintage deco night table to provide a contrasting element and tie the room to the present. Custom designed convector cabinets were installed at the windows throughout the apartment. 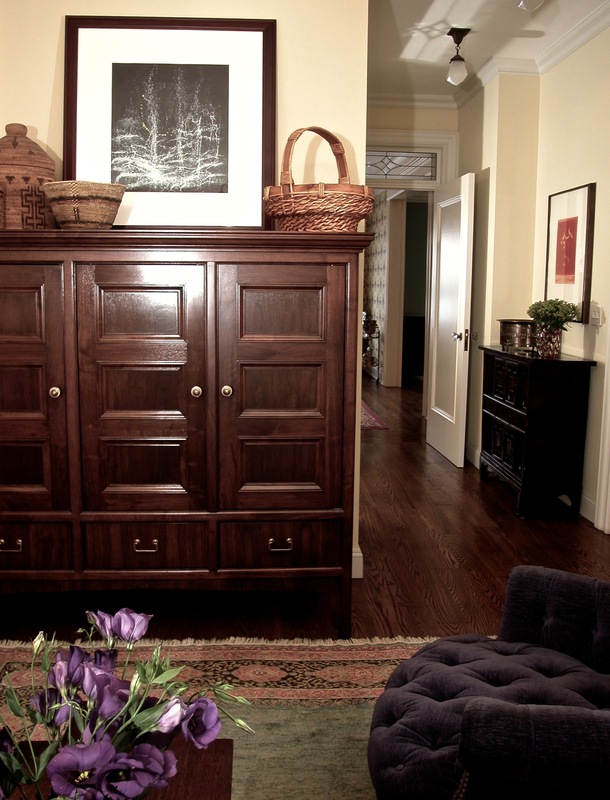 A cabinet was designed for housing a TV and sound equipment as well as additional dresser drawers. 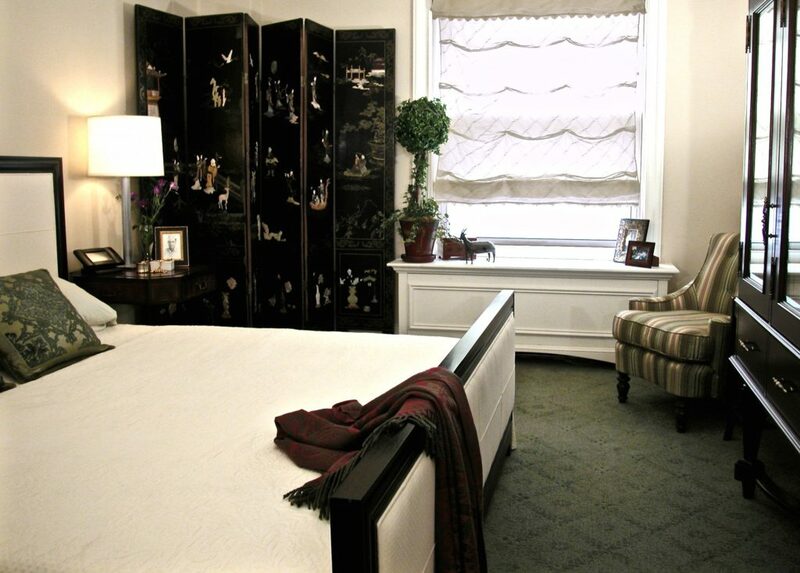 The glass doors with pleated silk curtains break up the wood, reflect light and add to the elegance of the room. The carved legs and curved stretcher at the base lighten the look and create the period feeling. Space for a shower was stolen from another bathroom behind. Marble mosaic creates texture around a pillowed marble floor. 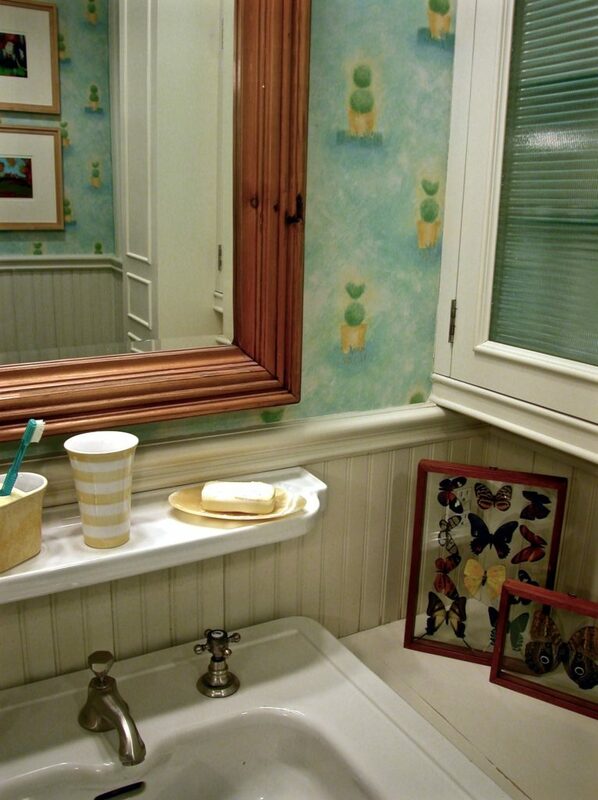 An antique vanity mirror sits on a half wall shielding the toilet from view. A reading materials bin was built into the half wall on the opposite side. A lace shade softens the pressed glass window. 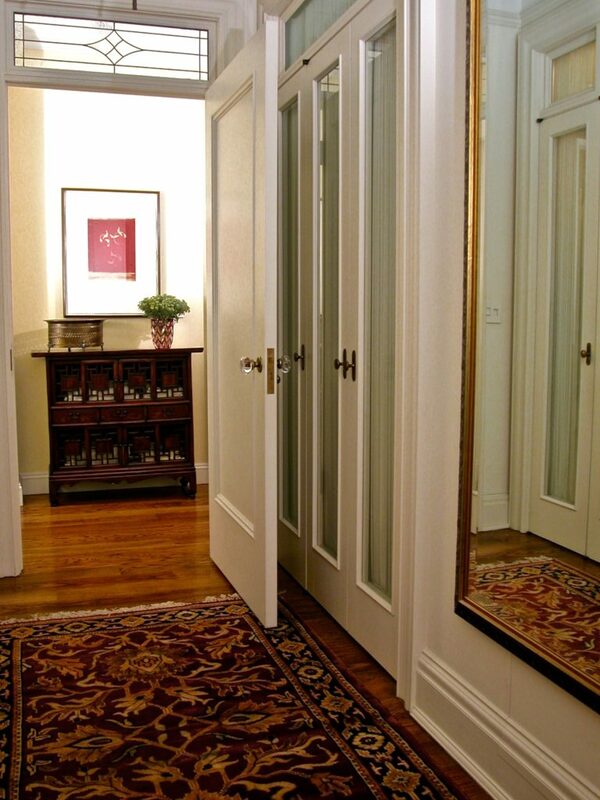 A custom built in medicine cabinet features a framed textured glass door. 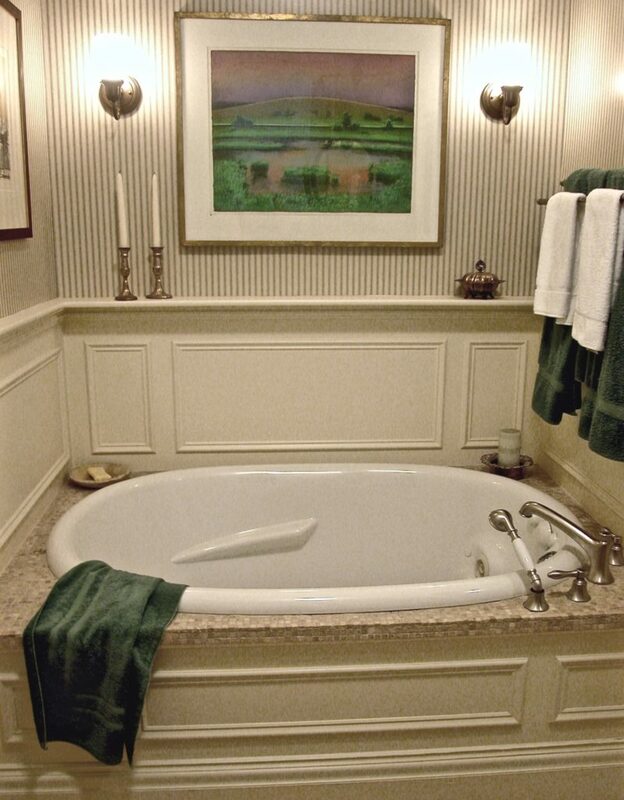 A whirlpool tub is housed in a paneled platform and surrounded by the paneled wainscote of the entire Master Bathroom. 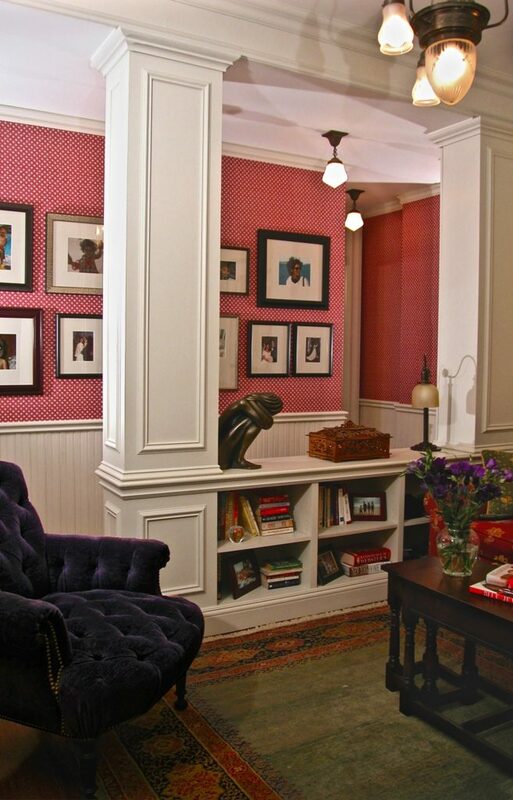 A new sitting room was formed by uniting multiple eliminated corridors and closets to create a family space off the kitchen. 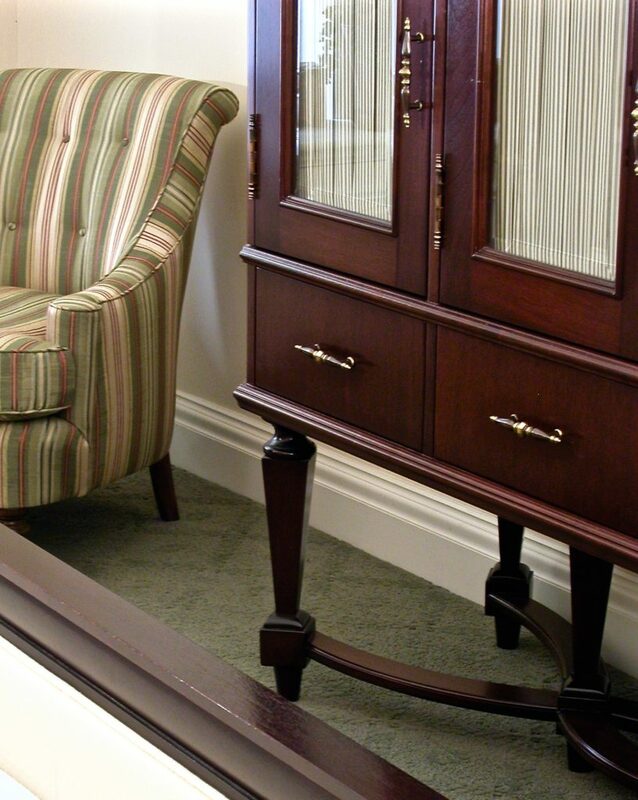 A custom designed cabinet houses a TV and storage with pocket doors to the screen. A remaining required corridor to two bedrooms was opened up to create more sense of space and to house pipes that could not be moved while adding storage in the cabinets below. 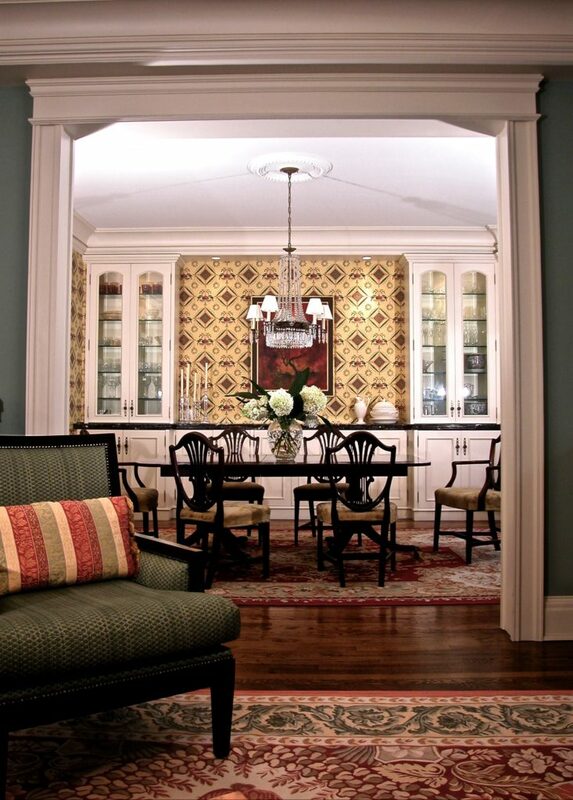 Between the kitchen and a new breakfast room another area was opened up with columns around existing pipes and cabinets below as in the family room which allowed for a view through to the table. 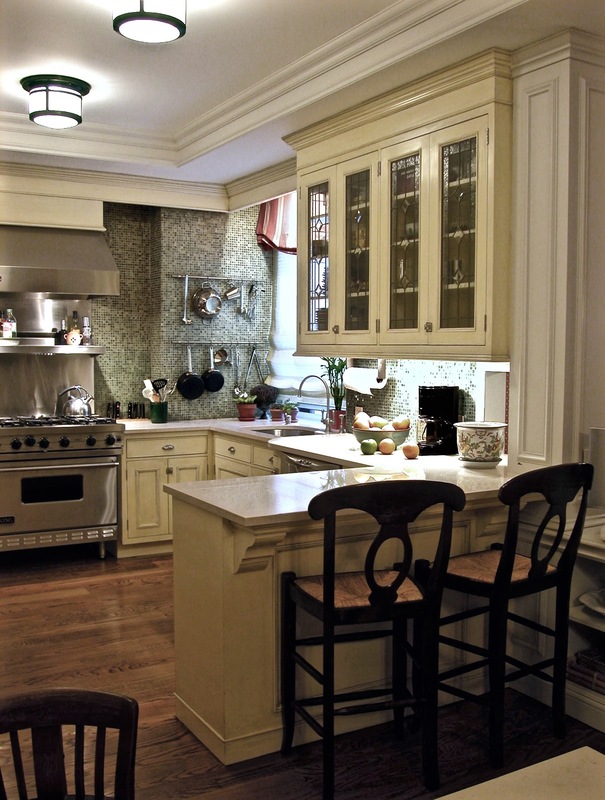 The kitchen cabinets are custom designed so that they allow for various setbacks and other anomalies in this 1906 building and maximize the storage space. The floor level was lowered to allow for the wood floor to continue into the kitchen keeping the flow from area to area level. 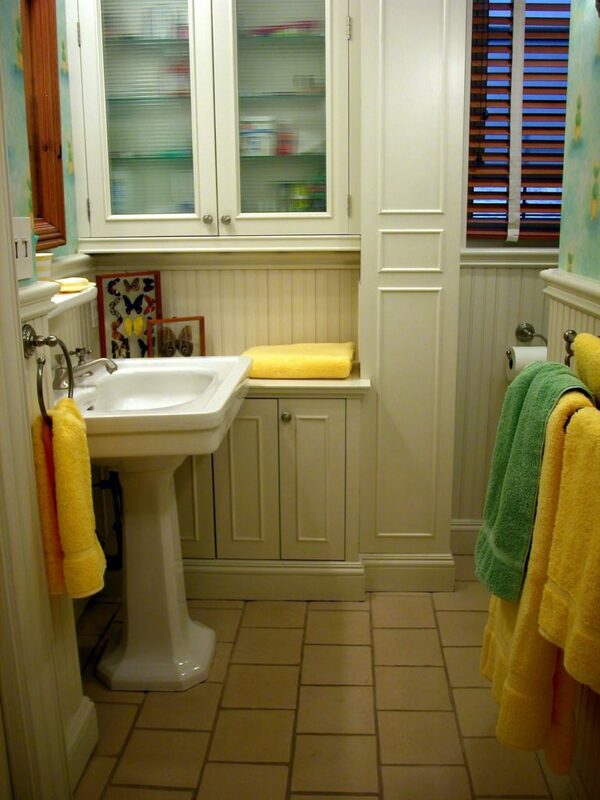 Beadboard wainscote ties the various open rooms rooms in the rear area together. 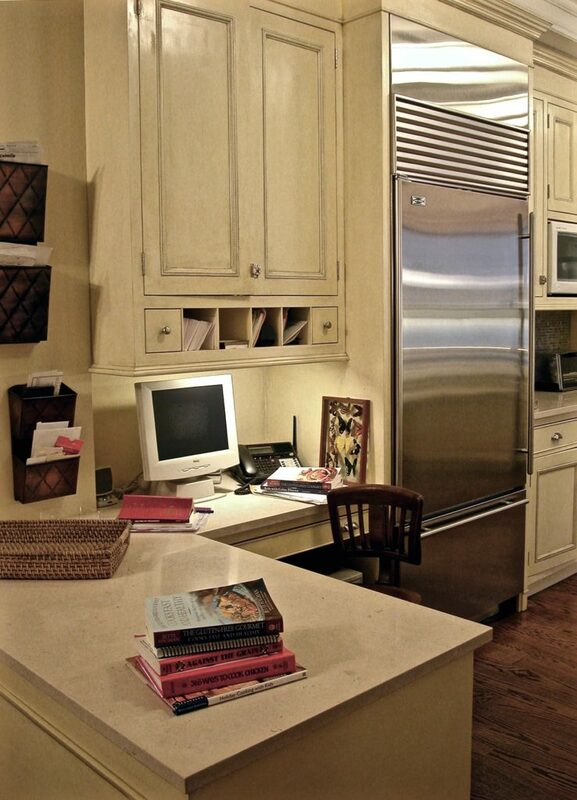 A desk facing the new family room was built into the Kitchen cabinets and seperates the two spaces. 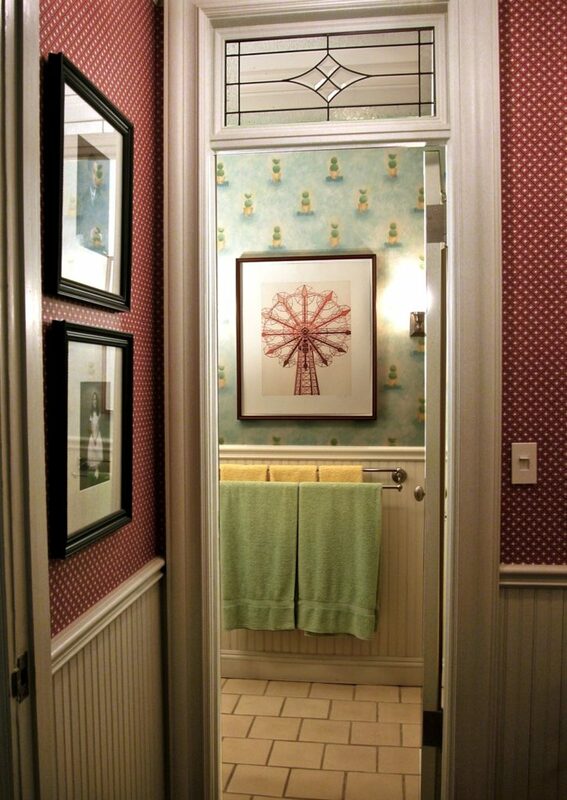 The Beadboard wainscote continues down the open corridor and into the Children’s Bath with it’s playful wallpaper and artwork. 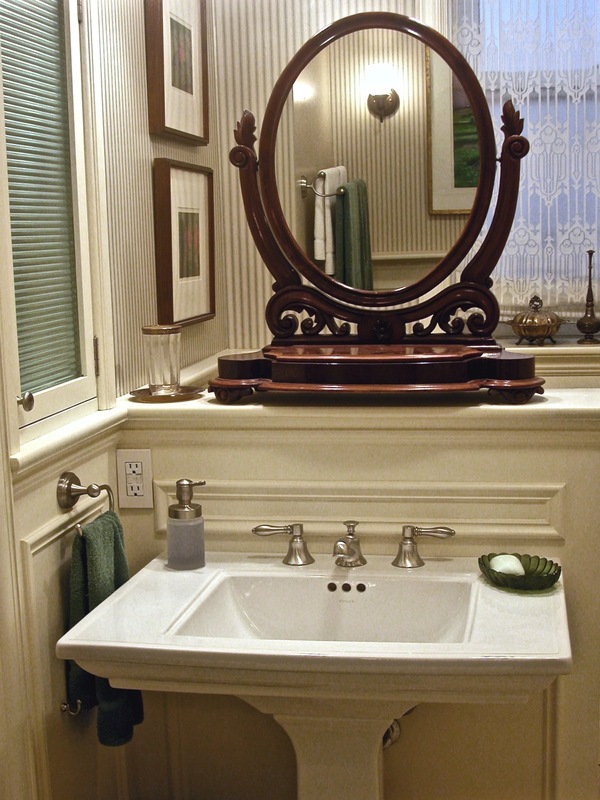 Custom built in cabinets provide storage next to the classic pedestal sink. 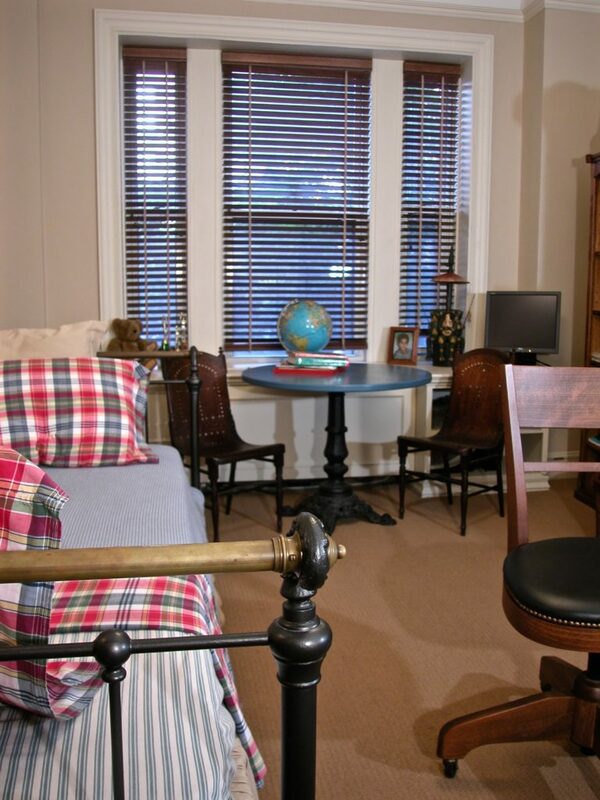 The boy’s room with it’s wood blinds, cast iron & brass bed and wood desk chair stays in period. 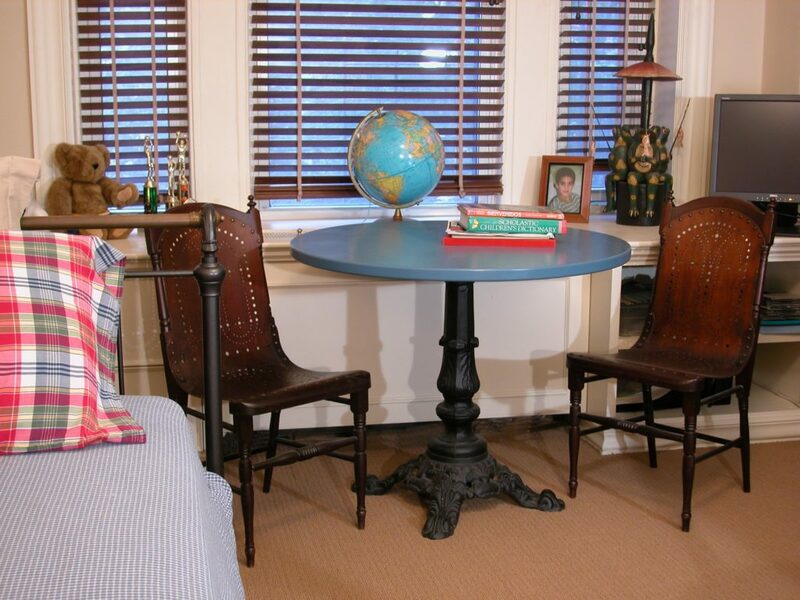 A pair of antique chairs sit by the window on either side of a work table with an iron base and lacquered top. 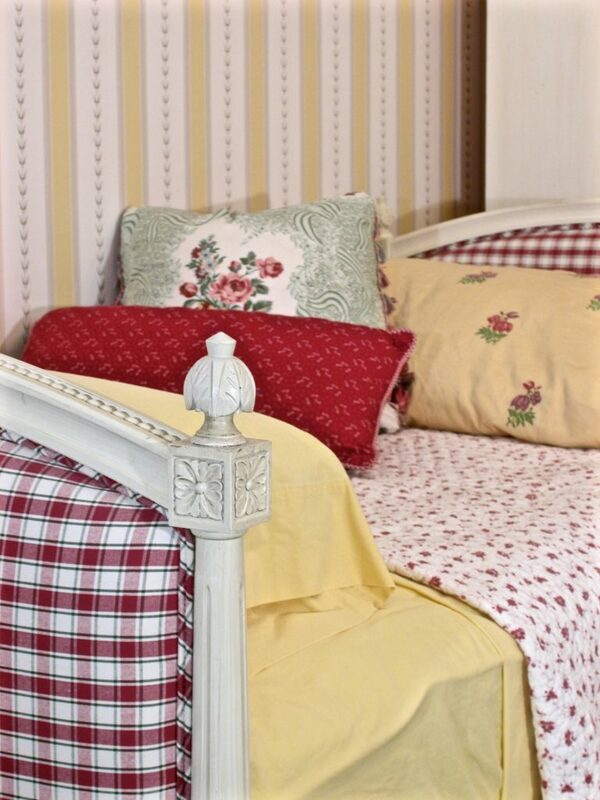 Floral patterns mix with plaids and stripes in this classic girl’s room. 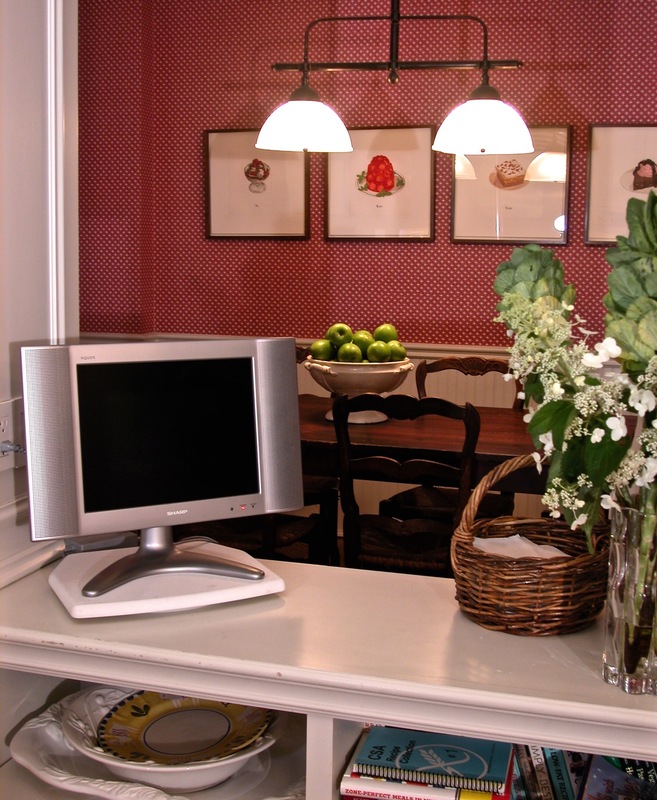 A wrought iron table was painted the white of the woodwork and built in cabinetry fills the window box. 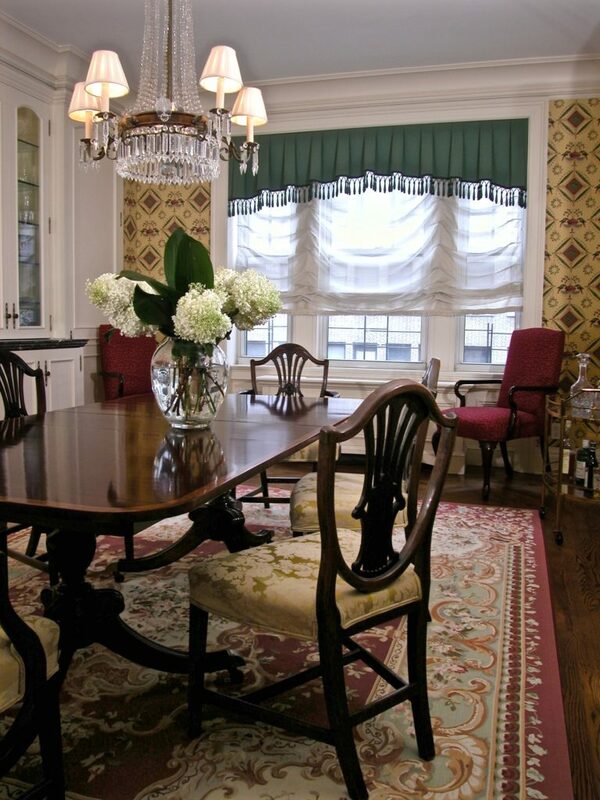 A sheer balloon shade is topped by a shirred valance. 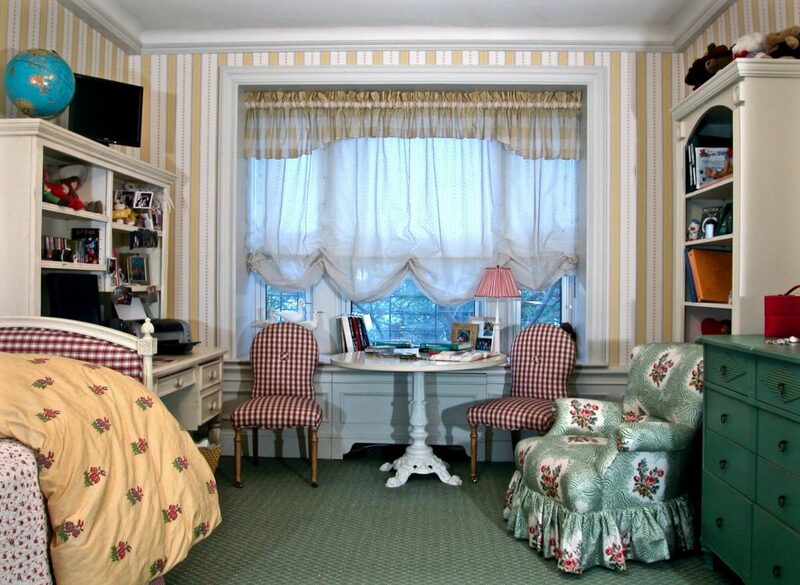 Plaid upholstered chairs flank the table and an upholstered floral lounge with a ruffled skirt provides a comfortable place to read.